Brigham and Women’s Hospital is world-renowned in virtually every area of adult medicine. As a teaching hospital of Harvard Medical School, its leadership in patient quality and safety, development of state-of-the-art treatments and technologies, and robust research programs have improved the health of people around the world. 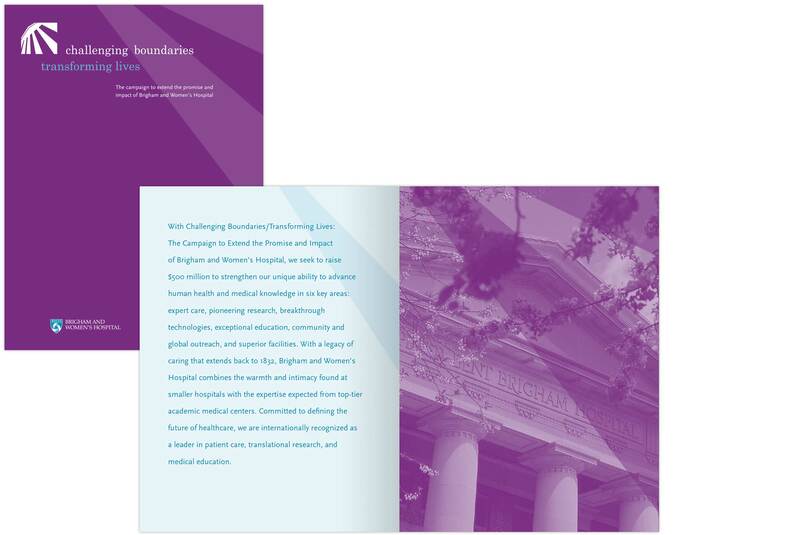 For four years we supported the Brigham’s capital campaign. We began with a vast list of fundraising objectives across the enterprise, totally twice the campaign goal. We worked with development staff to articulate a simple, memorable structure for overarching campaign messages, a campaign name and tagline, an identity for the campaign, as well as a system of fundraising communications that connects prospects with the people and causes that excite them most. An important part of this program involved engaging their volunteer leadership, both around message development and around the look and feel of communications. Main messages were distilled to map to the six pillars of the original hospital building.